Or rather a photo set on Flickr. Two weeks after returning from a whistle-stop tour of Norway after the Nordes conference, I’ve put my photographs online. Why the wait? Aside from a particularly busy period running participatory design activities, it’s finding the time to process all the photographs. Image quality being a top issue for me, I shoot in RAW format rather than JPEGs. This means storing all the information from the camera’s sensor rather than letting its software decide how to process that data into a JPEG image (contrast, colour balance and saturation etc.). The upside being you’ve all the data to work with when modifying an image (some being lost in the creation of the JPEG), the downside being you need to ‘develop’ each of your images. An intensive two weekend’s work and they’re done. I’ve been using Nikon’s Capture NX 2 software to do the RAW conversions and majority of image processing and, for Nikon owners, can thoroughly recommend it. * Anyone who’s travelled to Norway, or considered it, will probably have heard of the “Norway-in-a-nutshell” tour. 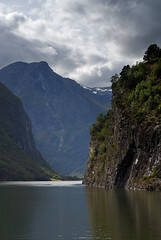 A great way to get a taster of mountain and fjord scenery via train, boat and bus. This entry was posted in Photography and tagged travel on September 21, 2009 by sjbowen.